Welcome to the return of my Superman comic commentary. Today's installment is Christmas-ish themed as it is a Metropolis Mailbag somewhat similar to Superman #64. 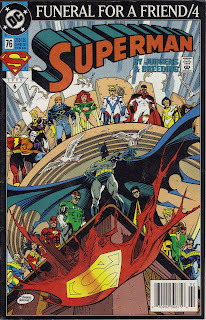 This issue is also part four of the eight part "Funeral for a Friend" storyline that occurred shortly after Superman was killed by Doomsday. This is one of my favorite covers because of all of the heroes and the image of the cape. We start off this issue with Captain Marvel marveling at how many heroes have gathered to break Federal law and read Superman's mail for Christmas. Batman, true to form during this time, spends an entire panel whining about the death of Jason Todd which was voted on by readers. It all has Guy Gardner insulting everyone who has written a letter to Superman. I was never a fan of the arrogant prick Guy Gardner, I like him better after he became Warrior but even then that like wasn't all that much. Anyway, the heroes begin reading the mail as Mitch Andersen arrives in Metropolis. Mitch was someone Superman saved during Doomsday's rampage and now he wants to pay his respects because Superman stayed and saved him unlike his father who left. Yeah, I guess that makes sense. Elsewhere, Lois and Jimmy are assigned to report on a woman calling herself Mrs. Superman which Lois refuses to believe for obvious reasons and then refuses to do her job and storms off to meet Ma and Pa Kent at Clark's apartment. They hug and talk and it's discovered that Lana Lang came too. So I don't know who is watching the Kent Farm right now. Unlike Superman #64, the only thing we really see these heroes do is a bunch of piddly stuff. Guy Gardner helps reunite a mother and son and Wonder Woman goes to reunite Mitch's father with his mother. Meanwhile, Green Lantern and Flash help rebuild the Andersen's house which is all fine and dandy but what about the other people whose houses were trashed by Doomsday? The JLA says they did it because even though her life had turned into a living hell, she still took the time to write to Superman to thank him for saving her and her family. So the Andersen family is all reunited except for Mitch who is still in Metropolis hanging out with Jimmy and Bibbo. Mitch is complaining about how Superman deserves more because he was a true hero and saved his family and that even his old man couldn't even hang around when things got tough. Mitch and Jimmy go to Centennial Park to the Superman statue to pay respects (because that is where Superman was buried--in the middle of a city park, not a cemetery or anything). Shortly after leaving, Lois, Lana and Ma and Pa Kent visit the statue. However, neither of them are able to hear the drills whirring underneath the statue so are oblivious to the fact that Cadmus is stealing Superman's body. Supergirl, along with Lois, will find Superman's body in part eight and Superman will be reburied and will soon recover from his death but what I find interesting about all this is the cover to this issue. Look at it, Batman stands front and center on the cover because he was DC's most popular character and Superman's closest confidante. However, if you look at the Doomsday trading card set produced by Skybox in 1993, Batman has been replaced by Captain Marvel! Don't believe me? Check out the Funeral for a Friend card based on Superman #76. Captain Marvel standing tall and proud. Look at the card based on Superman: The Man of Steel #20, Batman and Robin has been completely air-brushed out. The same is true on the reverse of the cards, which reproduced the funeral procession poster. Captain Marvel takes Batman's place carrying Superman's casket and some new hero named Thunderbolt takes Marvel's place in the procession. So, why the editing? Apparently it's because all DC Comics cards were produced by Skybox except for Batman, who were produced by Fleer. Well, I find it fascinating. I kind of want to hang up my Death of Superman poster now.